Melburnians rightly picture the architecture of the 19th century as ornate Classical. Yet there are very few remaining examples of what Georgian Melbourne looked like before the gold rushes. One standout example is on the corner of King and La Trobe streets. 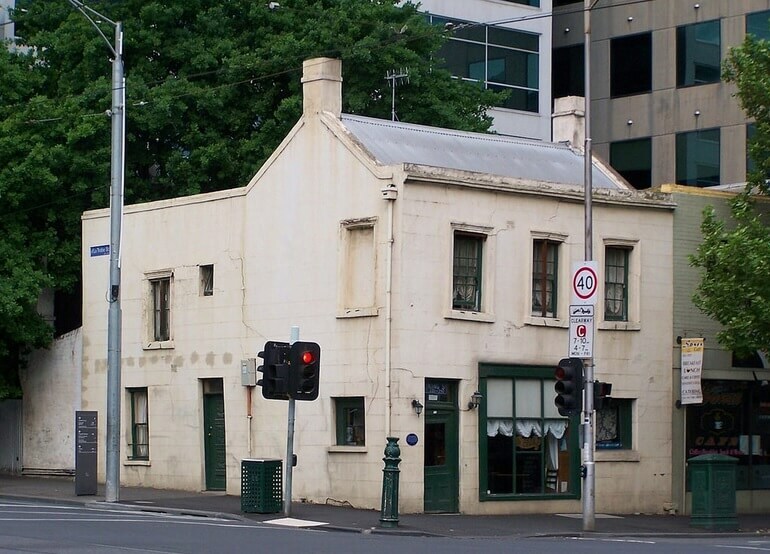 It is a white two-storey cottage and shop opposite the Flagstaff Gardens, somehow preserved amidst a 20th century forest. Built in 1850 by the Heffernan family just before the gold rushes served to create North Melbourne and other inner municipalities, and in continuous use as a residence since then, it is now heritage listed and relatively safe from destruction. Furthermore, an oak tree in its backyard has 'exceptional' status, a form of heritage protection available to extraordinarily distinguished trees. The tree grew from an acorn that George Dixon picked up and planted 40-odd years ago. 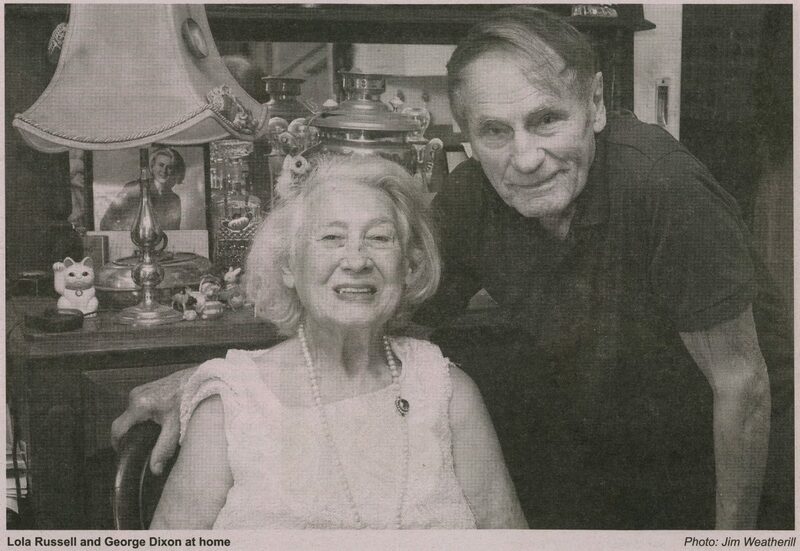 George has been in the cottage since he set up with his partner, Lola Russell. Lola was born in the cottage in 1921 and still lives there today, helping to run tearooms in the small shop that has housed a range of businesses across the centuries. Lola's grandfather, Valletto Azzopardi, bought the general store and newsagency in 1899 and subsequently bought the land and house in 1917. His daughter Beatrice Patricia married George Russell in 1919. They moved into the cottage with him in time for their daughter Lola to be born into the house she still lives in. Lola was mad for the theatre, and a polished singer. She met her future husband, George Dixon (he of the exceptional oak tree), at a performance of Romeo and Juliet. As so many people of the theatre did in those days, she took off for London at the end of the 1940s, leaving George behind to finish his degree. However, he missed her so much that he followed her to England and enrolled at Cambridge. On their return to King Street in the 1950s George moved into the cottage as a boarder. Both mixed theatre work with teaching. Performers do not retire but as she approached 70 Lola thought back over her full life and dictated her memories to George. The work, City Kid, was published last year and introduced to Hotham History earlier this year by its editor, Susan Pierotti. The book, Susan has said, is "the story of a woman and a building", of a cottage that is "the only continuously lived-in residence remaining in the CBD", and of "a smaller, more integrated, less fragmented world". City Kid is a very enjoyable read, written in a matter-of-fact, fairly understated way in incredible and loving detail and with fond nostalgia for a lost era. It also explores the precarious nature of theatrical employment and the need for initiative, networking and teaching jobs to survive between roles. Lola's memories of school, as student and teacher, take us to days when schooling was highly selective and to the beginnings of its great expansion in the 1960s. Extroverted and noisy but of noted ability, she was soon in the front row in King Street Primary. Of the 56 kids in Grade 8 only she and one boy could graduate to University High. She recalls her mother making her school uniform, sports gear and speech-night frock, and taking the tram to Hall's Book Store to buy secondhand textbooks. Her experience teaching in various high schools and tech schools had its ups and downs because it had to compete often with her first love, the theatre. This love began, as did her eventual marriage, in university theatre and the Union Rep and expanded into the main repertory theatres of the day, the Melbourne Theatre Company and the Little Theatre. It was shortly after her return from London that Lola was taken on by Wal Cherry, the new director of the Melbourne Theatre Company, to go on tour in an old converted bus. Everyone pitched in to set up and pack up equipment and props. This was Lola's "greatest theatrical experience" to date. At this point she finally considered herself to be "a fully developed actress". She then had work at the Little Theatre, as did George. As she puts it, "life had begun to be fun" and they were saving up to get married. 1961 typifies Lola's triumphs and trials. The country was in recession and she was in her third year of teaching at Coburg Tech. She knew she had to do "something in [her] artistic life". She decided to put on Harold Pinter's The Room — a double risk since it was a first performance and decidedly avant-garde. It performed at various venues to acclaim and came second in the Victorian Drama League Festival. Lola was awarded Best Actress of 1961 for her part as Rose. She then took on the formidable job of producing a double bill in the Russell Street Theatre for November. Friends helped book out the theatre. The season "received extremely good critiques and had tremendous publicity" and as a result she established Lola Russell Productions. The firm is still going. Lola Russell Productions introduced much avant-garde theatre to Melbourne audiences, including Samuel Beckett's Endgame with the late Peter O'Shaughnessy and Harold Pinter's The Dumb Waiter. Although her schools had gone to some trouble to accommodate her two professions, the intense theatrical activity of 1961 saw her sacked from the technical division for her many absences. She was of course devastated but found work teaching history three days a week at a Catholic school in Berwick — an extremely distant workplace for King Street's longest running resident. These days Lola prefers to stay closer to home and help George run the tearooms at her historic home, where her theatrical life still offers entertainment. Russell's Old Corner Shop Luncheon Room at 330 King Street is open 7.00am to 6.00pm Monday to Friday and is included in several historical tours offered around Melbourne. City Kid by Lola Russell was published by Palmer Higgs Pty Ltd in 2015.
by Jenny Cook and Bill Hannan, members of the Hotham History Project, June 2016.